This RV trip took us from Richmond into the eastern segment of the Rio Grande Valley of Texas. We enjoyed two weeks among the "Winter Texans" from far off places such as Ontario, Quebec, Wisconsin, and Illinois, to name a few. From about November until March many folks from "up north" come down to large 1000+ space RV Parks in the Brownsville, Harlingen & McAllen area. They meet up with many thousands of less welcomed guests coming from "down south" via various modes of transportation. Brownsville gives you the taste of being in Mexico without some of the danger in the real thing. We spent most of our time in the many nature parks that dot the area. There are many birds that migrate from South & Central America into the area, but no further north. We saw many colorful birds that we had never seen before. It was a nice trip and we enjoyed the area - but not enough to want to live there for very long. We hope you enjoy our story and photos. We left home about 9:30 AM on Monday, February 26th, but didn't make it very far from the house before we discovered that the trailer brakes didn't appear to be working - big trouble. We drove cautiously to the Bluebonnet RV Service in Richmond and fortunately a mechanic was able to get us going in about an hour. We traveled south on US Hwy-59 and made good time. We decided too stop for the night at Kingsville at Country Estates Mobile Ranch (a just-get-by park in spite of the name). 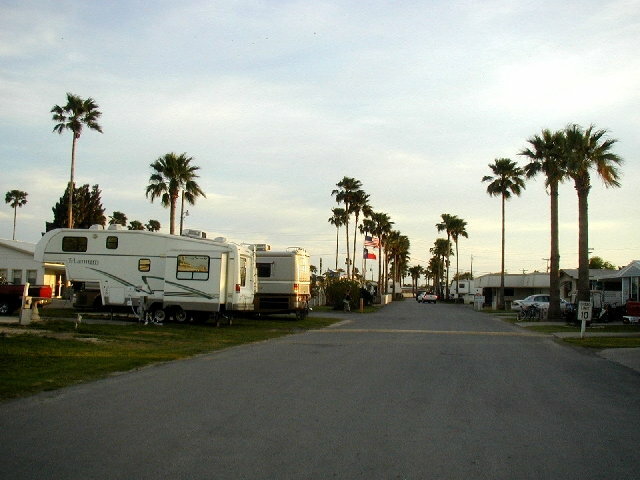 Tuesday morning was a short drive to Harlingen and Sunshine RV Resort. We arrived by lunch. This large 1065-site park is populated this time of the year almost exclusively with "Winter Texans". As we walked about the park we saw relatively few Texas license plates. 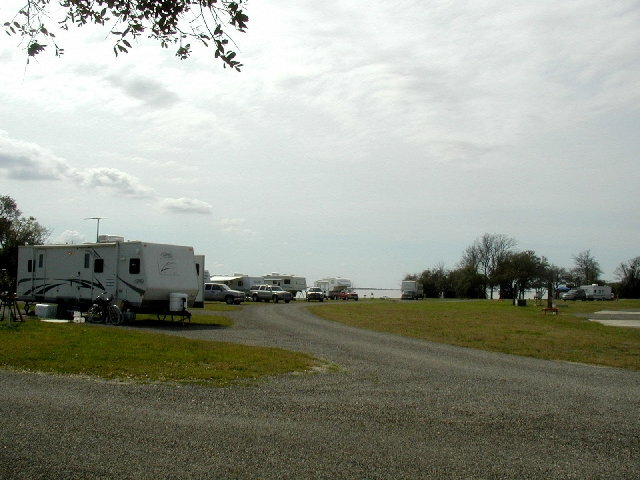 < Our campsite at Sunshine RV Resort. The parks in the Valley cater to folks that want to live there for up to half the year. There are quite a few "park models" stationed along with the trailers and motor homes. They offer everything in recreation and social life to sustain the population during that time. We found that some people leave their trailers there all year to hold their "spot" and either drive or fly back and forth from their other homes. It's definitely a community of communities within these large parks. We saw gatherings of folks from Quebec all speaking French. Some of the staff speak French, Spanish and oh yes English. These parks are a very interesting place to visit in themselves. Not our type of life though. In the afternoon we went to the nearby Texas Travel Center and picked up some area literature to plan our stay. We made the customary Wal-Mart stop on the way back. Wednesday, February 28th, we drove west on US Hwy-83 to Alamo, then south on TX-907 to Santa Anna National Wildlife Refuge on the shores of the Rio Grande River where we spent the day hiking and birdwatching. Before lunch we tried to follow the Willow Lakes Trail, but the combination of poor map and unmarked trails got us on the Chachalaca Trail when we took the wrong cutoff. Anyhow, it all worked its way out and we saw a lot of the park and quite a few birds, but not as many as we expected. Being novices at birdwatching, we spend most of our time digging through our portable bird library trying to identify "that bird". We found the 40-foot observation tower that was recently built and from the top of it we made our first and only spotting of the Altamira Oriole - WOW! We also made our first of many siting of the Great Kiskadee - another colorful and vocal bird. After a picnic lunch, we took a short walk close to the visitor center prior to taking a guided 1 1/2-hour tram tour around the 7-mile Wildlife Drive. They stop at an old cemetery along the way. They stop near the Rio Grande River and we walked a short trail down to the river and could look over into a farm in Mexico. We saw some of the trash bags that the "wetbacks" left behind with their wet clothes. Afterwards, we took the short Pintale Lake Trail down to another Rio Grande River overlook. Afterwards we drove back to the park. 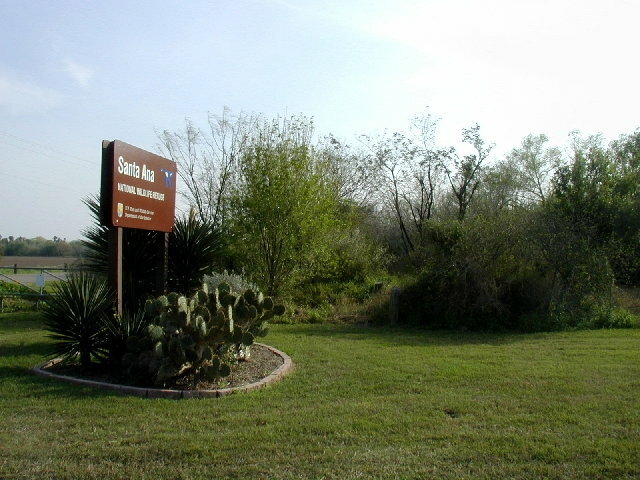 < Entrance to Santa Ana National Wildlife Refuge. < Along Willow Lakes Trail. 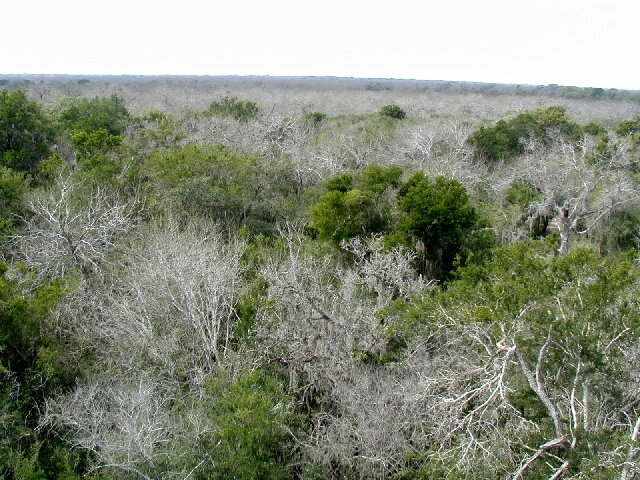 < View from the 40-foot observation tower. 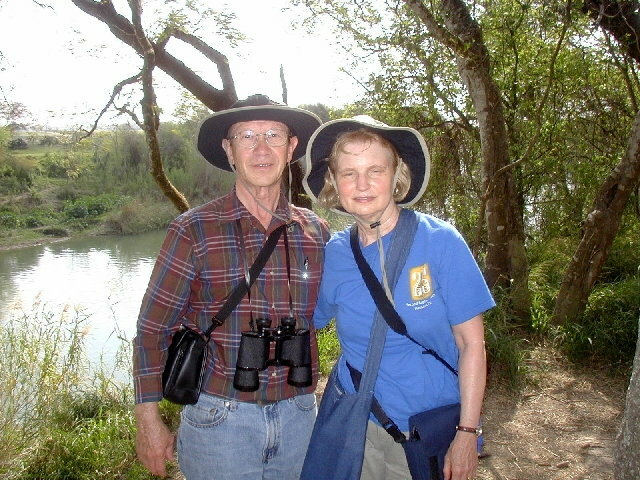 < Lawson & Kay at the Rio Grande River. 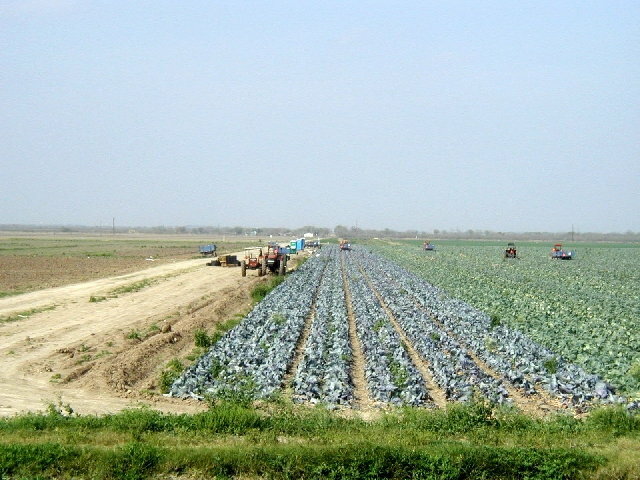 < Large fields of produce border the Refuge. Thursday, March 1st, in the morning we took the Harlingen Heritage Trail, a historical tour of Harlingen. 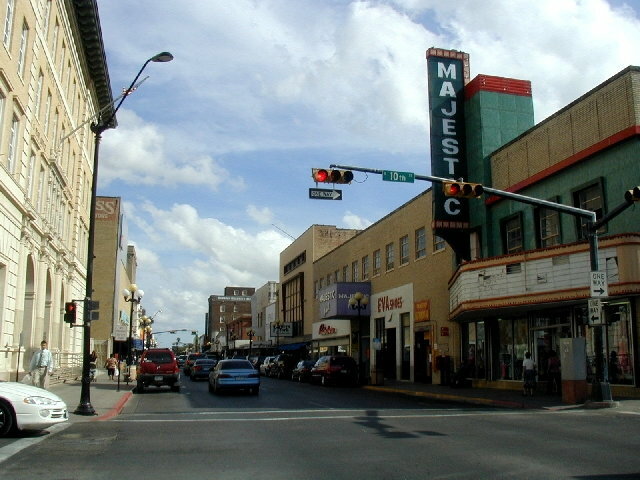 It covers the Downtown Business District and the Silk Stocking Row reflecting Harlingen's early prosperity. Afterwards, we drove back to the park for lunch. After lunch we went by the Harlingen Public Library to check our email. 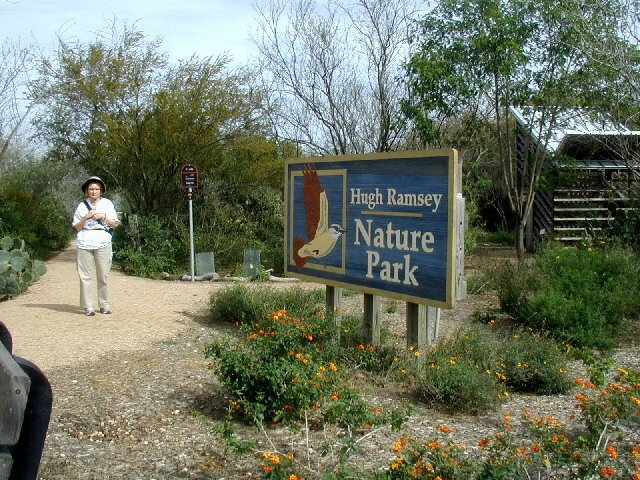 Hugh Ramsey Nature Park is nearby so we went there to see what it held for us. It is a nice park with very good trails and some good viewing blinds. It is bordered by Arroyo Colorado and FM-106. On the way home we picked up a bag of freshly picked Valley oranges from a roadside vendor. < Kay at the entrance to Hugh Ramsey Nature Park. Friday morning we drove west on US Hwy-83 to Weslaco and the Valley Nature Center. 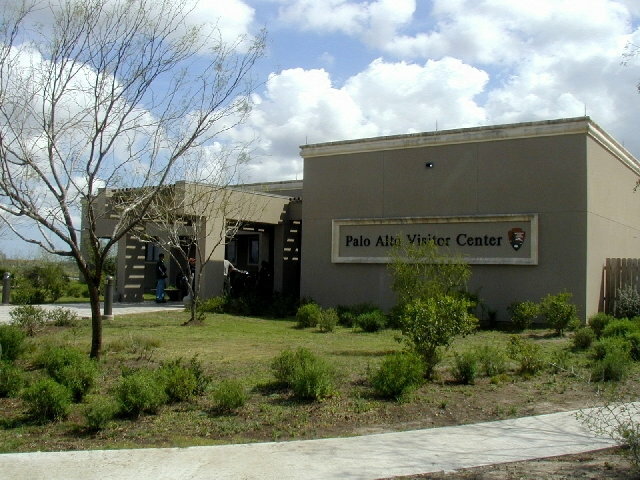 The Center is five acres of native habitat in the heart of Weslaco that is home to many birds and butterflies. There are many crisscrossing trails and it is easy to walk all of them. It is a very good birdwatching spot for being in the middle of a city. We saw our first chacalaca (large brown bird) here. < Entrance to the Valley Nature Center. 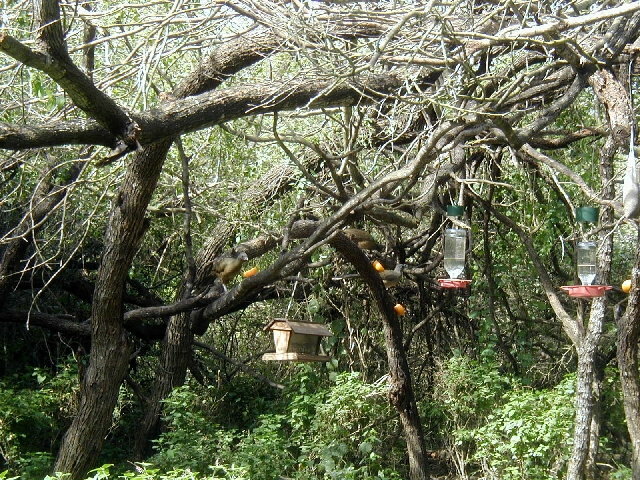 < Chacalacas at the feeding station. We ate a picnic lunch at a table at the entrance to the Nature Center and saw many other interesting birds. 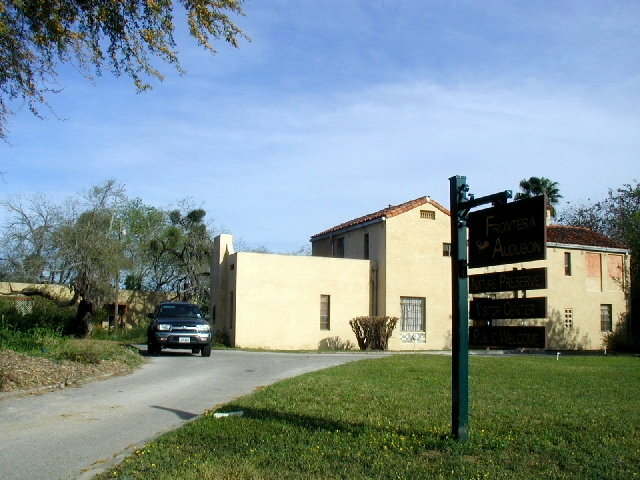 Afterwards, we took a short few blocks drive to Frontera Audubon Center, which is also located in downtown Weslaco. It was a little late in the day when we got there so we weren't able to stay long before we had to leave due to park closing. But, we were still able to walk all the trails and stop at the feeding station and the viewing blind overlooking a small lake. We were able to see more chacalacas and one or two more new birds. It is a nice park worthy of the visit. 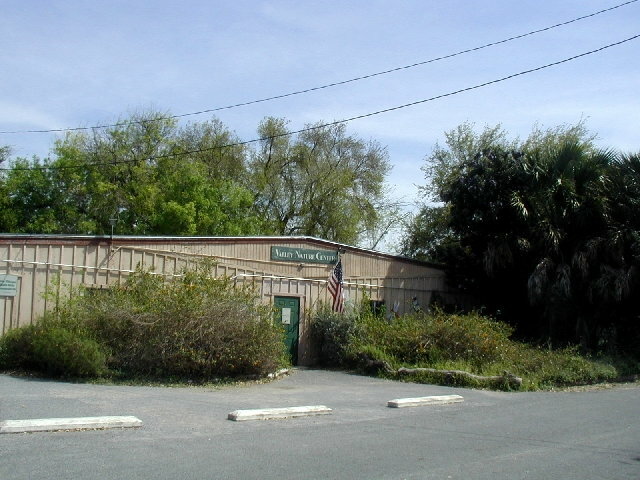 < Entrance to Frontera Audubon Center. Saturday morning we left Harlingen pulling the 5th-wheel via US-83 & TX-100 to Port Isabel. 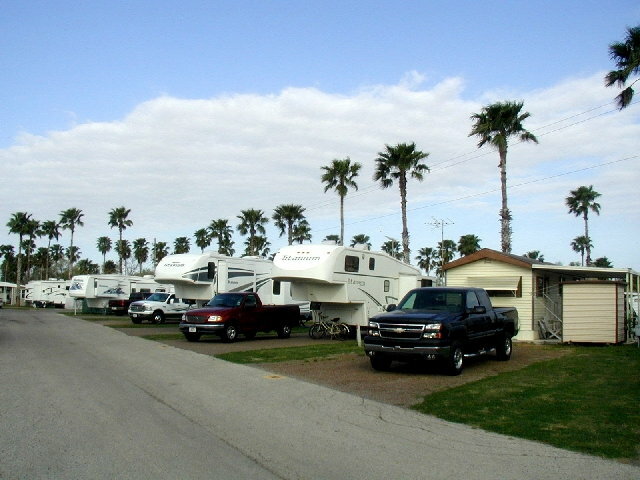 We parked at Port Isabel Park Center RV park. A cold front was blowing in an the wind was so strong it make outside activities very unpleasant. 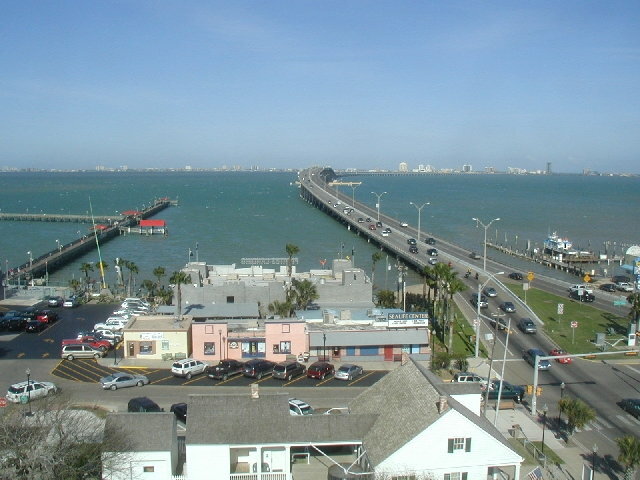 In the afternoon we decided to drive over the Queen Isabella Causeway bridge to South Padre Island. We drove around and looked at the beach homes and high-rise hotels and condos. 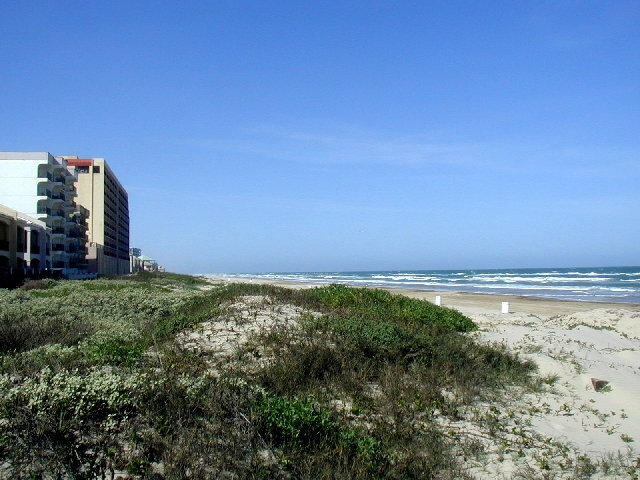 < South Padre Island beachfront. 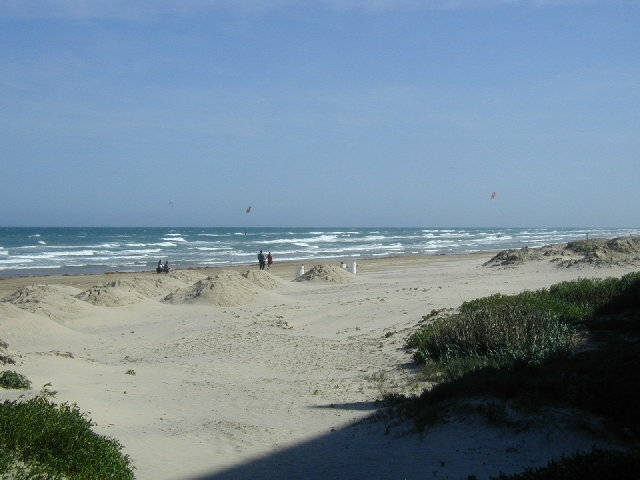 < South Padre Island beachfront. On the way back to the park we stopped at the Port Isabel Lighthouse. Constructed in 1852, it was built to protect and guide ships through Brazos Santiago and the barrier islands. In 1952, the Lighthouse was opened as a State Park and remains the only lighthouse on the Texas coast open to the public. The Lighthouse Keeper's Cottage, on the grounds, houses the Chamber of Commerce. We made the long winding steep stair trip to the top, but the wind was so strong that we couldn't get out on the exposed platform. You can view from inside the glass light enclosure protected from the elements. 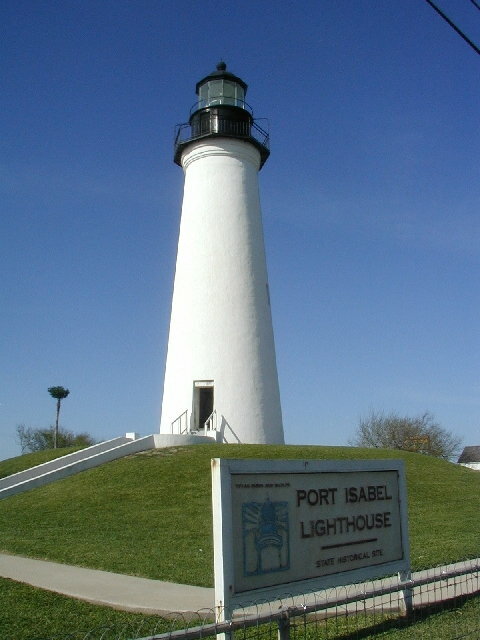 < Historic Port Isabel Lighthouse. < View of South Padre Island from the Port Isabel Lighthouse. Sunday was overcast, cold (in the 40s) and very windy so we decided to stay inside until late morning. 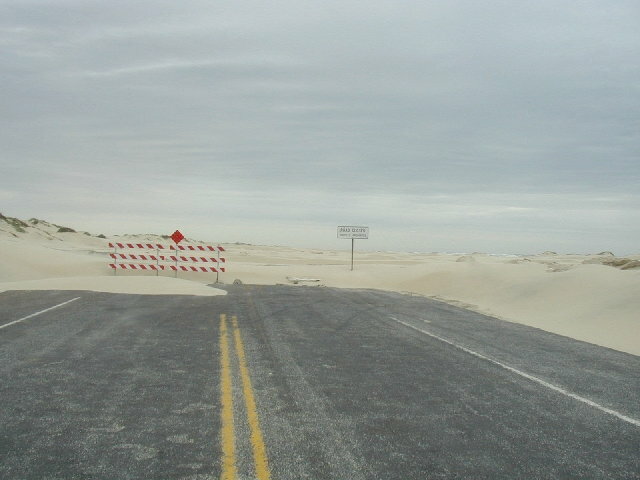 We then drove back to South Padre Island and went north on TX-100 to where it dead ends. There is not much but sand dunes for the last 3-4 miles. We saw beachside lots (sand piles) for sale for $120,000. No thanks! The first hurricane will deposit their remains somewhere inland. < The end of TX-100. We came back across the bridge, ate lunch at the Fisherman's Landing and drove back to the park, stopping to see some of the fishing boats adjacent to the park. 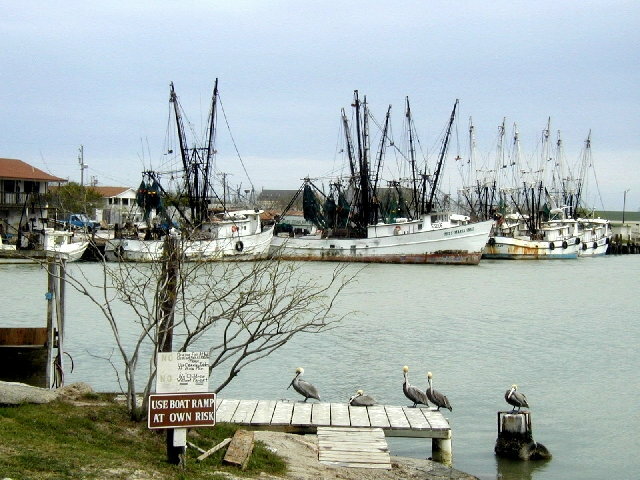 < Port Isabel Fishing boats. Monday morning we left Port Isabel via TX-48 to 4 Seasons RV Park in Brownsville. This is another of the "Winter Texan" sites. After lunch we went to the Brownsville Public Library to check our email, then back to the park to do the weekly laundry. < 4 Seasons RV Park. Tuesday we spent the entire day at the Gladys Porter Zoo in Brownsville. There are 26 acres with tropical plants and some 1,300 animals. 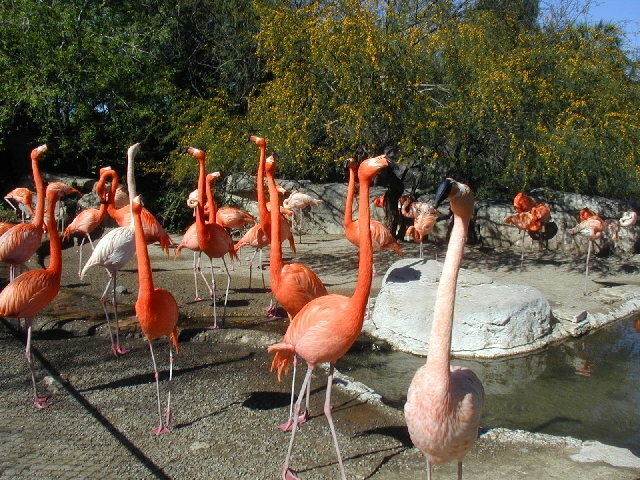 The Zoo is known for its successes in breeding endangered species of wildlife. 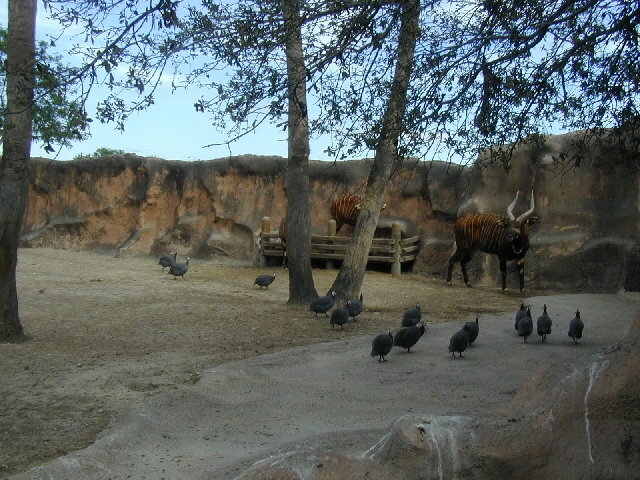 Opened in 1971 as one of the first zoos in the country with no barred cages, most animal species are displayed in settings that closely resemble their own natural habitats. It was a very interesting way to spend the day outdoors. 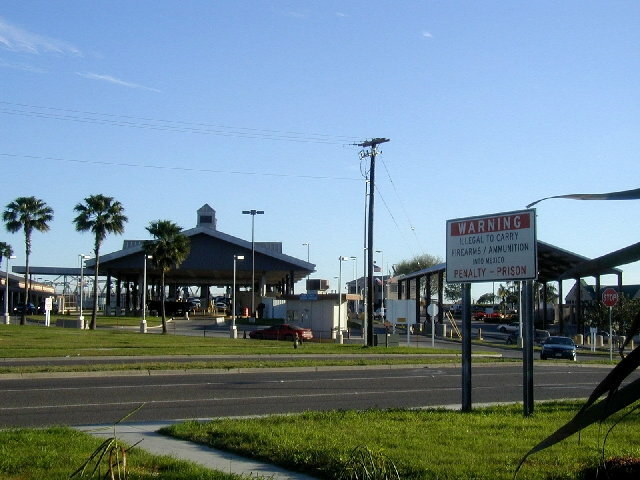 On the way back to the park, we drove by the United States Port of Entry to Mexico. That's close enough to Mexico for us! 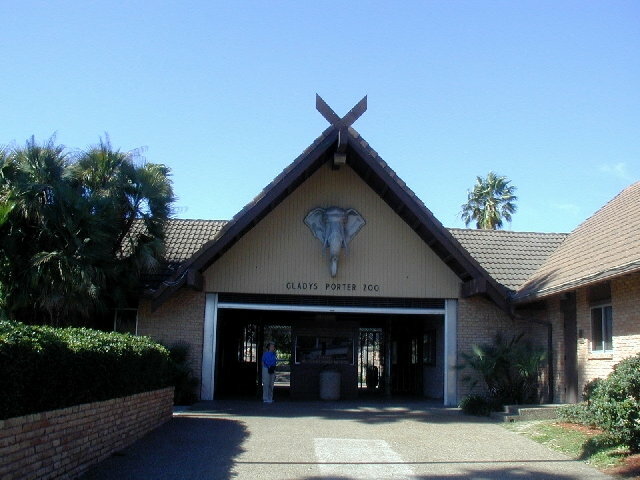 < Kay at the Gladys Porter Zoo entrance. < Caribbean Flamingos. < African Bongo. < United States Port of Entry. Wednesday, May 7th, we spent the day at Sabal Palm Audubon Bird Center. 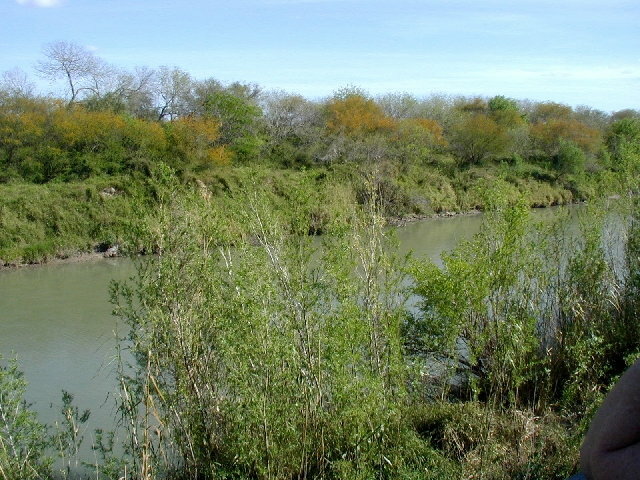 This is another of the parks that border the Rio Grande River. Surprising to us was the dense forest along the river banks, after seeing all the open land bordering the Center. We walked the Resaca Loop Trail and saw many birds, such as the green jay, black tufted titmouse, yellow rumped warbler, chacalaca, long-billed thrasher and ruby crowned kinglet. We also saw a bobcat a short distance from the Center office. After lunch we walked the Native Loop Trail which goes down for an overlook at the River. 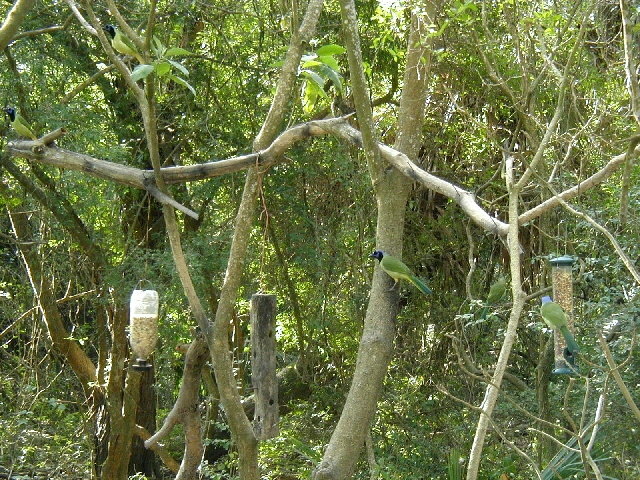 < Green jays at the feeding station. < Rio Grande River overlook. Thursday we drove a short distance north of Brownsville to the Palo Alto Babblefield National Historic Site. There is an interesting museum detailing the historic battle of 1846. In the early afternoon of May 8, 1846, 2,300 U.S. troops, led by General Zachary Taylor, escorting 300 wagons full of supplies, marched out of thickets of thorny brush and onto the broad prairie known as Palo Alto. 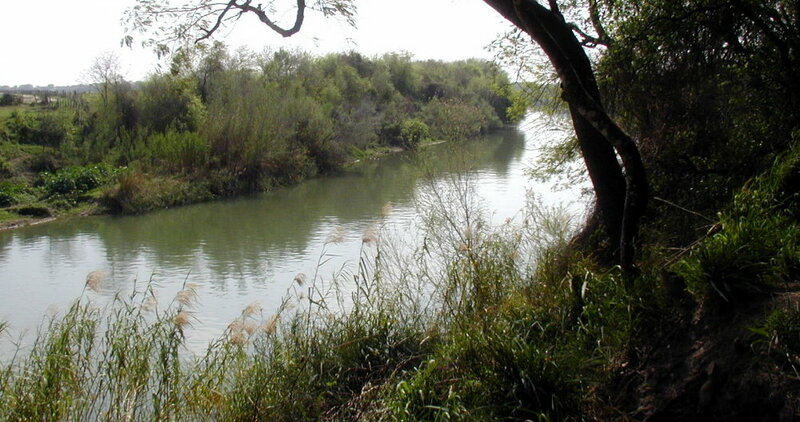 Across the field, where the road toward Matamoros once again entered the chaparral, some 3,200 Mexican soldiers lined up to block the way. Within minutes, the peaceful coastal prairie - named for the "tall trees" that ringed the field - erupted with the rumble of artillery fire. For five hours the two armies engaged in a fierce battle. The Mexican army finally withdrew, but this encounter set the stage for a 2-year-long war. < Palo Alto Battefield Visitor Center. After lunch we walked around downtown Brownsville, visiting the Cameron County Courthouse and some of the historic homes and businesses. We looked around the many Mexican style shops and junk stores that line the downtown streets. 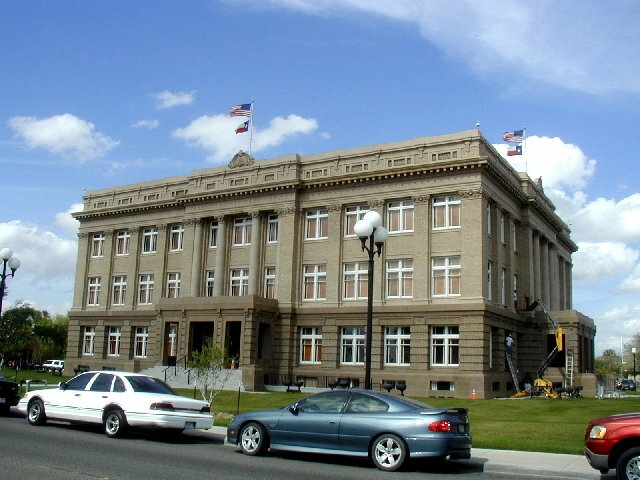 < The Cameron County Courthouse. 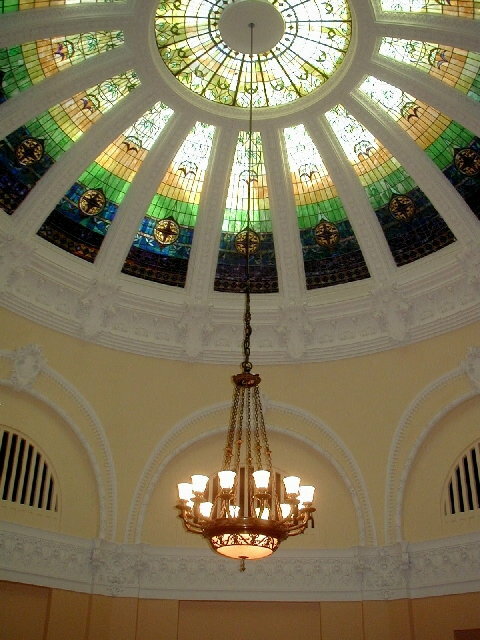 < Inside the Courthouse. < Typical downtown Brownsville street. Friday morning we departed from the Rio Grande Valley via US-77 and US-59 to Edna, where we spent the night at Brackenridge Plantation Park and Campground on Lake Texana. 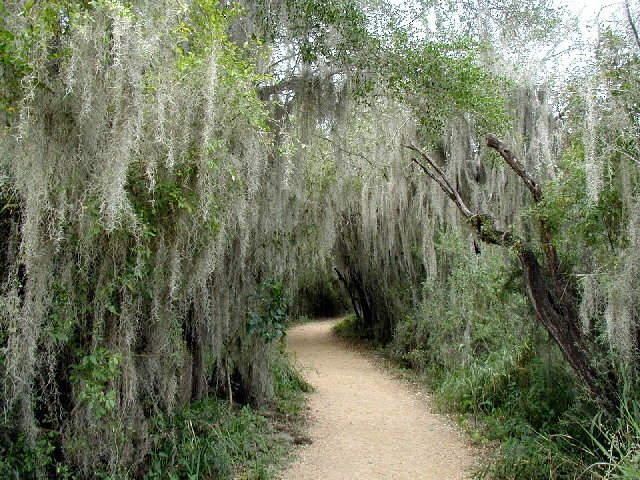 The park is located across TX-111 from Lake Texana State Park. This well-equipped historical park is a good alternate when Lake Texana S.P. is full on the weekend. The weather was a little stormy overnight. 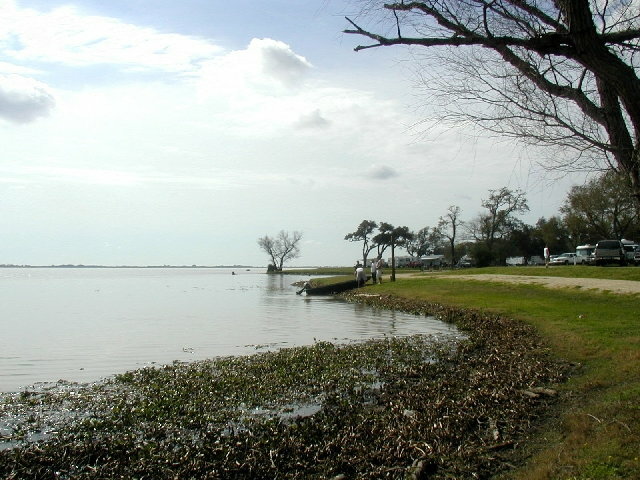 < Lake Texana from the park. < Our campsite on the lake. Saturday morning we made the short drive from Lake Texana to Richmond. This draws to a close our short visit to the Rio Grande River Valley of South Texas. We hope you enjoyed the photos and brief descriptions of our activities. God willing, join us again soon for another RV adventure.